It is difficult finding the perfect TV tray. One is too high, the other is too low. Not to mention that you have to carry it around every time you need it. But what if I told you that there is an adjustable TV tray that will also provide assistance when you want to sit down or get up? Here is where Assist-a-tray comes in. Click here to check price. This is the Assist-A-Tray. Click here to read customer reviews on Amazon. Assist-A-Tray is one of the best TV trays for recliner chairs on the market. It is a simple device that goes under your recliner. With the help of the handle, it gives assistance whenever you want to get up or sit down. What’s more is that it also has a swivel tray on which you can eat, place your computer, or can use it as a resting place for your hands. Who is it destined to? There is a number of reasons why some people may need help while sitting down or getting up from a chair. They may suffer from old age, which makes it difficult for them to transition from two different positions. Another reason why people prefer Assist-A-Tray is that they have been injured and need a little help while they are recovering. Also, some people choose this product merely because they like having a TV tray that is constantly attached to their recliner. No matter the reason, anyone can use Assist-A-Tray for whatever reason they like. 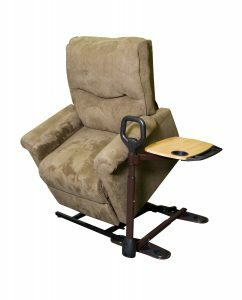 The Assist-A-Tray works great with lift chair recliners. Click here to view prices. The primary purpose of Assis-A-Tray is helping people with low mobility. As I said above, some people find it difficult to accomplish simple tasks such as getting in and out of their sitting chair, for different reasons, which is why they need help. Aside from the primary use, the device can also be used as a simple TV tray. They are very popular amongst people who enjoy watching TV while eating, so having one installed at all times comes in handy. Why take out your TV tray every time when you want to use it if you can only pull it from the side of you favorite sitting chair? Assist-A-Tray is one of the best TV trays for recliner chairs because the user can enjoy a various number of features and benefits. You can adjust the device to fit perfectly to your recliner. The base, as well as the handle and tray, can be adapted to fit your requirements. There are various types of recliners; some of them are tall, some of them have a larger depth than others, but Assist-A-Tray fits almost all of them. You can conveniently use the tray whenever you want. One of the best features of Assist-A-Tray is that the tray itself pivots 360º. Whenever you are not using it, you can just rotate it on the side of the recliner. The when you need it, pull it right back. It’s that simple. A simple TV tray cannot do that, can it? The tray has a cup holder and an extended compartment. That way you are safe from spilling liquids on the floor. The extra compartment can be used to keep small items within reach, such as a pen or mobile phone. You don’t want them rolling over on the floor now, do you? Assist-A-Tray has super grip feet. That means that the legs are covered in rubber so the device will be steady and safely secured under the recliner. Also, this features keeps your floors safe. They will not suffer dents and scratches. Why should you buy Assist-A-Tray? First of all, because you may need it. If you have difficulties with getting up or sitting down, this product is specially designed for you. There is no shame in seeking help, but if there is a device available to provide assistance, then why not? It’s always at your service and never complains. It is the perfect little helper. Secondly, Assist-A-Tray is the perfect TV tray for recliner chairs. It is constantly there; you don’t have to take it out and install it every time you want to eat while watching TV. Simply pull it from the side and there it is. Also, if you are in the habit of spending a lot of time on the recliner with your laptop on your lap, you are going to love this product. You can place the laptop on the tray and use it from there. Not to mention that the computer will not heat up as fast and you will not have to put it down every time you want to get up. You can simply push it away and pull it back when you return. Last, but not least, Assist-A-Tray is super easy to install. All you need to do is insert the handle in the base, attach the tray, then put the whole thing under the legs of your recliner. The installation process does not require any tools whatsoever. It seems that the product does not fit all recliners, especially those who have metal rails instead of legs. It’s not about the size, but the rubber pads are hard to place. Also, the chair may be a little uneven if it doesn’t have adjustable legs. You may have to place something under the other rail/legs to even the recliner. There is no big difference, but you may notice it after a while. Assist-A-Tray is very popular with the elderly. 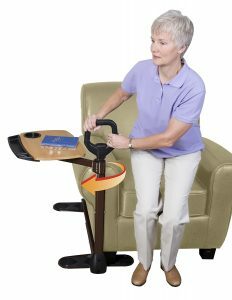 It provides excellent support and stability while getting in and out of the recliner, all while offering the benefits of a TV tray. It is also highly recommended to people with impaired mobility due to various accidents. According to customers’ reviews, this product is one of the best in its category. Click here to buy it on Amazon. We rate the Assist-A-Tray 4.5 out of 5 stars.